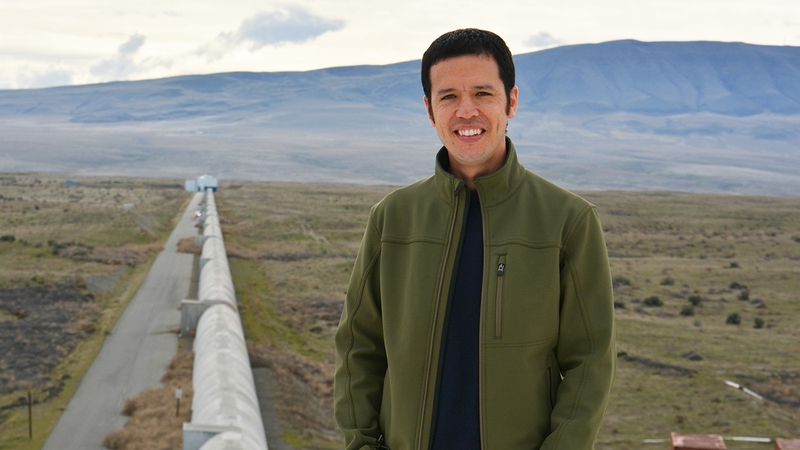 Robert Ward (pictured at the LIGO facility in Hanford, WA) graduated from UNM in 2000 with a B.S. in Physics. He now works as a research fellow at the Australian National University as well as with the LIGO collaboration. 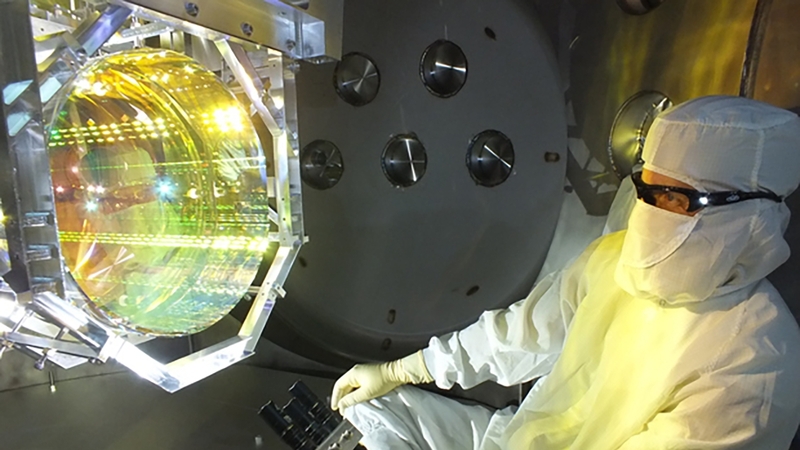 Prior to sealing up the chamber and pumping the vacuum system down, a LIGO optics technician inspects one of LIGO’s core optics (mirrors) by illuminating its surface with light at a glancing angle. When Robert Ward (B.S. 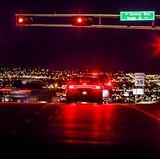 Physics, ’00) first came to The University of New Mexico in the late-1990s, he had no idea he’d be part of one of the most important scientific discoveries of the past century. 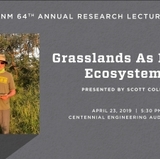 20 years later, that’s exactly what happened and now, the UNM alumnus can say he is part of a Nobel Prize winning team too. The 2017 Nobel Prize in Physics has been awarded to Rainer Weiss, Barry Barish and Kip Thorne for the detection of gravitational waves – ripples in the fabric of spacetime, confirming a portion of Albert Einstein’s 1915 general theory of relativity. While the three senior scientists were named in the award and have been guiding members of the project for many years, a team of more than 1,000 researchers around the world, including Ward, were also part of the incredible discovery. 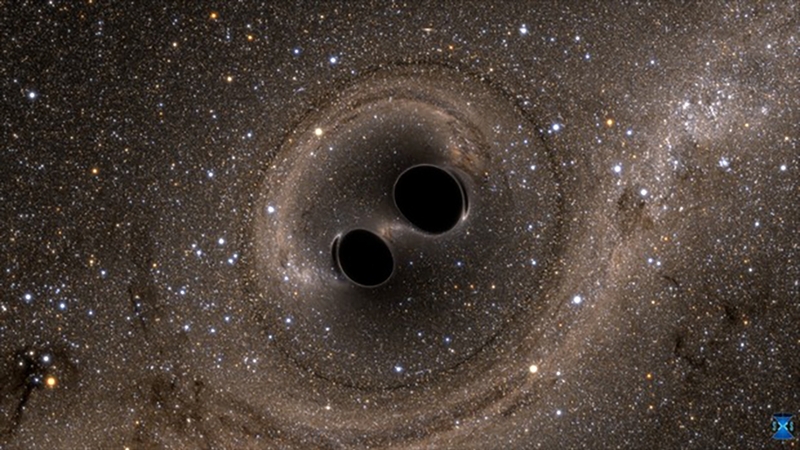 The 2015 discovery of gravitational waves using the Laser Interferometer Gravitational-Wave Observatory (LIGO) stunned the scientific community and the world. The waves that were detected were the product of a deep-space collision between two black holes nearly 1.3 billion years ago. Scientists believe the discovery could provide important clues into the origins of the universe. Ward has been a part of the LIGO collaboration since 2003 and has helped develop and test the technology that went into the second-generation detector. His entire career, in fact, has been spent prototyping the techniques used to in breakthrough – and he says it’s just the beginning. 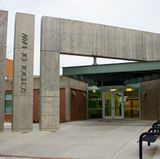 An Albuquerque-native, Ward split his time at UNM between the Department of Physics & Astronomy and Theatre, where he took a number of acting classes and performed in several plays. He says UNM had a tremendous influence on him and credits the University for his development not only as a scientist but as a person, too.